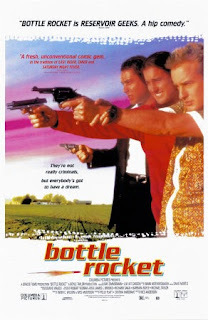 Tag line: "They're not really criminals, but everybody's got to have a dream"
Wes Anderson’s debut feature, Bottle Rocket, which was based on a short film of the same name he directed in 1992, may not have been a commercial success (produced for $7 million, the movie took in a mere $1 million at the U.S. box office), but it did introduce his unique style, as well as newcomers Owen and Luke Wilson (who had no previous acting experience), to the world. After spending a few months in a psychiatric unit for exhaustion, Anthony (Luke Wilson) is ready to face the world again. But despite the fact the facility’s administrator (Ned Dowd) said he’s free to go, Anthony’s best friend Dignan (Owen Wilson) insists on “busting him out” of the place. So, instead of walking out the front door like a normal person, Anthony humors his buddy by climbing out the window of his second-floor room and shimmying down a rope made of bedsheets as Dignan, hiding in the bushes, waits for him below. This is the first of many “crimes” that Dignan (who dreams of becoming a career thief) has planned out, and he desperately wants Anthony to join his gang. With little else to do, Anthony agrees, and after a trial break-in (where they rob Anthony’s house), the duo recruit their pal, a rich kid named Bob (Robert Musgrave), to serve as their getaway driver, and together the three hold up a bookstore. Now wanted by the authorities, they decide to lay low for a few days by checking into a motel situated in the middle of nowhere. According to Dignan, his ultimate goal is to join forces with Mr. Henry (James Caan), the proprietor of the landscaping service he once worked for, who he claims is an experienced thief. Now that they’ve pulled their first job, Dignan assures his pals that it’s only a matter of time before they and Mr. Henry’s crew team up on some bigger heists. But while they’re kicking back, enjoying their success, Anthony meets and falls in love with Inez (Lumi Cavazos), one of the housekeepers at the motel where they’re staying. What’s more, Bob learns that his abusive older brother Jon (played by Andrew Wilson, Luke and Owen’s brother) has been arrested for growing marijuana (in reality, the pot belonged to Bob). All at once, neither Anthony nor Bob want to continue with their life of crime, a decision that doesn’t sit well with Dignan. So, the three go their separate ways, only to be reunited by Dignan a few months later to take part in a major heist that he and Mr. Henry have planned out. If it’s a success, all of them will walk away with a boatload of cash, but on a job as big as this, the risks are also greater, meaning that any hitch could land them in prison. For Dignan, the risk is worth taking, but will Anthony and Bob go along as well, or will they decide to sit this one out? From its slightly off-kilter characters to its breezy soundtrack (featuring songs by Love and The Rolling Stones), Bottle Rocket serves as a fine introduction to Wes Anderson’s singular style (there’s even a nifty slow-motion scene late in the film, much like the ones that made their way into Rushmore and The Royal Tenenbaums). What’s more, the movie stars the Wilson brothers in what was their big-screen debut, both of whom manage to make us like their characters, in spite of their flaws. Owen Wilson, in particular, brings an endearing naiveté to the role of Dignan, a young man out of his element who tries his best to convince those around him that, one day, he’ll make a great crook. But from the word “go", we can sense his insecurities; during the book store robbery, Dignan calls the location’s middle-aged manager (Darryl Cox) an “idiot” for grabbing a small bag for the cash instead of a large one. When the manager snaps back at him, calling him a “punk”, a clearly intimidated Dignan immediately starts to act more civil. Yet his inexperience as a thief only makes the character more likable, and we find ourselves rooting for him, even though we realize he has zero chance of becoming a big-time criminal (the final moments of Bottle Rocket are simultaneously hilarious and heartbreaking). As evident in my write-ups of some of his other movies (including Rushmore, The Royal Tenenbaums, and the recent The Grand Budapest Hotel), I’m a big fan of Wes Anderson’s, whose unique flair improves from one film to the next (as it is with Martin Scorsese, Quentin Tarantino, and a handful of other directors, I consider a new Wes Anderson movie an “event”). In Bottle Rocket, we witness the birth of the director’s distinctive style, and thanks to the Wilson brothers, it’s also a hell of a lot of fun.